A pastry chef or patissier; the French female version of the word is patissiere, is a station chef in a professional kitchen, skilled in the making of pastries, desserts, breads and other baked goods. They are employed in large hotels, bistros, restaurants, bakeries, and some cafes. The pastry chef is a member of the classic brigade de cuisine in a professional kitchen and is the station chef of the pastry department. 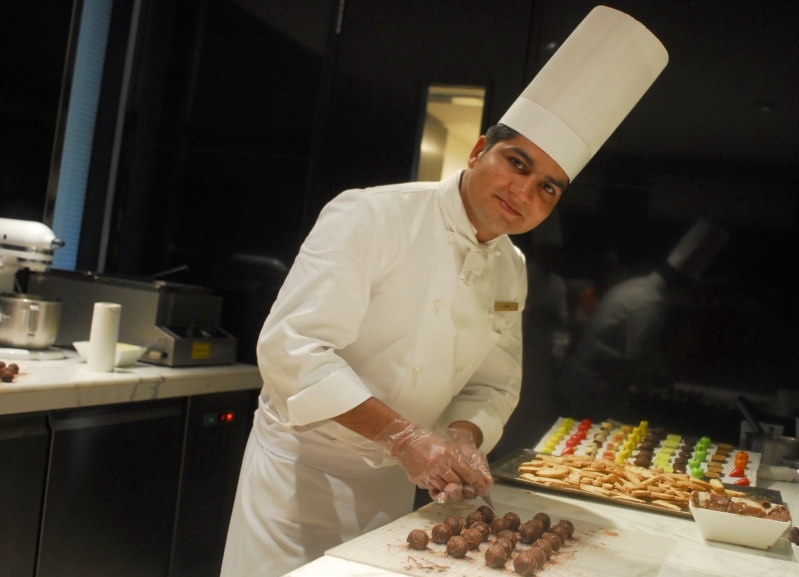 Day-to-day operations can also require the pastry chef to research recipe concepts and develop and test new recipes. Usually the pastry chef does all the necessary preparation of the various desserts in advance, before dinner seating begins. The actual plating of the desserts is often done by another station chef, usually the garde manger, at the time of order. The pastry chef is often in charge of the dessert menu, which besides traditional desserts, may include dessert wines, specialty dessert beverages, and gourmet cheese platters. Pastry chefs are also expected to fully understand their ingredients and the chemical reactions that occur when making fine pastries. Precise timing and temperatures are critically important.